The machinima competition is open to machinimists from all the world! 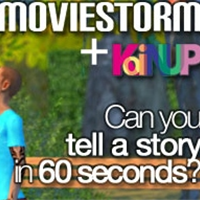 If you're a machinimist, you're invited to create a funny/exciting/amazing short video, under 1 minute lenght, by using the Moviestorm, machinima dedicated native software. DOWNLOAD NOW and post the video here on Koinup! DEADLINE FOR SUBMISSIONS EXTENDED TO 14TH OF JUNE!!!!! How do I delete a video here? Moviestorm is the complete 3D movie making software application for all abilities. Whether your movie interest is cartoons, crime, music, horror, video blogs, kids shows, romance, action or anything else, Moviestorm provides the ideal solution. Unlike game-based machinima tools, Moviestorm is designed as a virtual movie studio from the ground up, and there are no issues with copyright. Moviestorm's radical pricing system allows customers to buy it outright or subscribe on a monthly basis for just $7.99 / €6.49 / £4.99. Content packs are also available for rental by the day or the month, which gives film-makers maximum flexibility at minimum cost. This enables Moviestormers to get started quickly and try out all the different packs without a large cash outlay.